San Salvador de Jujuy, capital of the Jujuy province, might be the busiest city in the northwest – or at least it feels that way. Walking out of the bus station, the first thing you notice is the traffic, the noise, the people running around everywhere, and the flea market. San Salvador de Jujuy is the northernmost city of Argentina, at the foot of the altiplano, your last stop on the way towards the Quebrada de Humahuaca and Bolivia. The people from San Salvador are mostly of mestizo heritage, and culturally are often closer to Bolivians than Argentineans. The accent, you’ll find, is much slower, which is a mixed blessing – though the rhythm is easier to follow, they tend to pronounce words less clearly as well. It takes getting used to! As you pass through the city, views of the colonial buildings, views of the valley and the river emerge, mixing with more modern buildings, billboards, stores and street vendors selling anything and everything, and a constant flow of people. 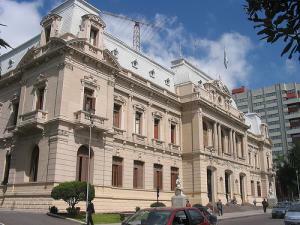 It is radically different from Salta “la Linda” or Tucumán, the town of the Independence. A mix of Andean culture with modern architecture and an overall sense of being in a hurry, San Salvador is worth the detour if only out of curiosity. 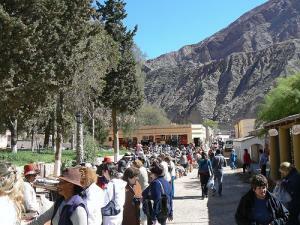 It probably won’t be worth staying longer than a couple of days, but the city serves as a great starting point for excursions into the Yunga, or the Quebrada de Humahuaca. The most photogenic area of San Salvador de Jujuy is around the Plaza Belgrano, the main plaza of the city. Flanked on one side by the Iglesia Catedral, and on another by the Casa de Gobierno, this is the center of the colonial architecture of San Salvador. The Iglesia Catedral is beautifully decorated on the inside, and the Casa de Gobierno happens to have the first ever made flag of Argentina. Plaza Belgrano fills up in the cooler hours of the early evening with people sitting, chatting, and observing the world around them. This is truly the most pleasant area of San Salvador to walk around. There is also the Museo Policial across the street from the Plaza Belgrano, a quaint museum that traces back the history of the police, from uniforms to what its duties entail, if anything, it’s interesting! Other than that, simply strolling through town will reveal occasional buildings and sites of interest, from the restaurant housed in the Spanish Culture Center, to the views on the Río Grande to the east of town. While it isn’t always beautiful, its mishmash of architecture is surprising, at times pleasantly so.